The Julius Maximilian University of Würzburg (also referred to as the University of Würzburg, in German Julius-Maximilians-Universität Würzburg) is a public research university in Würzburg, Germany. The University of Würzburg is one of the oldest institutions of higher learning in Germany, having been founded in 1402. The university initially had a brief run and was closed in 1415. It was reopened in 1582 on the initiative of Julius Echter von Mespelbrunn. Today, the university is named for Julius Echter von Mespelbrunn and Maximilian Joseph. Its official name is Julius-Maximilians-Universität Würzburg (or "Julius-Maximilian University of Würzburg") but it is commonly referred to as the University of Würzburg. This name is taken from Julius Echter von Mespelbrunn, Prince-Bishop of Würzburg, who reestablished the university in 1582, and Prince Elector Maximilian Joseph, the prince under whom secularization occurred at the start of the 19th century. The university’s central administration, foreign student office, and several research institutes are located within the area of the old town, while the new liberal arts campus, with its modern library, overlooks the city from the east. The university today enrolls approximately 29,000 students, out of which more than 1,000 come from other countries. Although the university was first founded in 1402, it was short-lived. This was attributed to the lack of financial security and the instability of the age. Johannes Trithemius, well-known humanist and learned abbot of the Scottish monastery of St. Jacob, held the then dissolute student lifestyle responsible for the premature decline of the city's first university. In the Annales Hirsaugiensis Chronologia Mystica of 1506 he cites bathing, love, brawling, gambling, inebriation, squabbling, and general pandemonium as "greatly impeding the academic achievement in Würzburg". Evidence of this is provided by the fatal stabbing of the university's first chancellor, Johann Zantfurt, in 1413, by a scholar's unruly assistant, or famulus, evidently the result of these very influences. Despite Egloffstein's thwarted first attempt at founding a university, the city still boasts one of the oldest universities in the German-speaking world, almost on a par with Prague (1348), Vienna (1365), Heidelberg (1386), Cologne (1388), and Erfurt (1392). A university in Würzburg was refounded more than 150 years later. A "second founding" by Prince Bishop Julius Echter von Mespelbrunn (1545–1617) in 1582 offered the institution guaranteed autonomous self-government. The university was fiercely Roman Catholic and initially considered a "bastion of Catholicism in the face of Protestantism", words also used in the university charter which prevented all non-Catholics from graduating from or receiving tenure at the Alma Julia. Echter intended it as a tool of Counter-Reformation. Over a century would pass before the university opened its doors to non-Catholics, in keeping with the spirit of Enlightenment encouraged by Prince Bishop Friedrich Karl von Schönborn's newly formulated students' charter of 1734. The resultant increase in religious tolerance even enabled the summoning and subsequent appointment of the famous physician, Karl Kaspar von Siebold, under Schönborn's successor, Adam Friedrich von Seinsheim. Shortly after his arrival in 1769, Protestant medical students were permitted to study for their doctorates at the university. Würzburg's increasing secularisation as a bishopric and its eventual surrender to Bavarian rule at the beginning of the 19th century resulted in the loss of the university's Roman Catholic character. The end of the city's status as a Grand Duchy under Ferdinand of Toscana in 1814 heralded the Alma Julia's ideological transition to the non-denominational establishment which endures to this day. This new inclusiveness towards professors and students alike was instrumental in the resultant upturn in all areas of research and education in the 19th century. Since then, the university has borne the name of its second and most influential founder, officially known as the Julius-Maximilians-Universität of Bavaria. The many medical accomplishments associated with the university from the mid- to late-19th century were inextricably linked with achievements in the affiliated field of natural science, notably by Schwab, the eminent botanist, Semper, the zoologist, Wislicenus, the celebrated chemist and Boveri, the biologist. Their progress culminated in the discovery of x-rays by physicist Wilhelm Conrad Röntgen, first winner of the Nobel Prize for Physics, in 1895. Röntgen's discovery, which he dubbed a "new kind of ray", is regarded as the university's greatest intellectual achievement, and, simultaneously, a scientific development of huge global import. Röntgen's successors, namely Wilhelm Wien, Johannes Stark and the chemists Emil Fischer and Eduard Buchner, also number among the succession of Nobel Prize winners to lecture at the university, a tradition which endures in the modern-day example of Klaus von Klitzing. 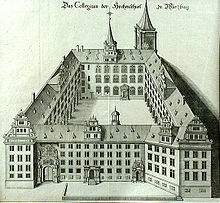 After World War II, the free state of Bavaria invested a fortune in the rebuilding and renovation of the university buildings, which had been severely damaged by Allied bombing. Restoration of Echter's "Old University", current home to the faculty of law, continues today. The eventual rebuilding of the Neubaukirche ("Neubau Church"), also affiliated to the legal faculty and almost razed to the ground in 1945, marked the end of the city's extensive reconstruction process. In 1970 it was decided that the church, one of the most important examples of 16th century vaulted architecture in southern Germany, should fulfill a dual function as a place of worship and as the university banquet, assembly, and concert hall. Echter's heart, removed for safekeeping during the war, has once again found its place in the church he designed, fulfilling a request made during his lifetime. ^ a b c d "Facts and Figures". University of Würzburg. Retrieved 2017-06-22. ^ a b c "The University of Würzburg: a History of Success". University of Würzburg. Retrieved 21 April 2015. ^ "CG Member Universities". Retrieved 15 September 2014. This page was last edited on 1 December 2018, at 00:49 (UTC).